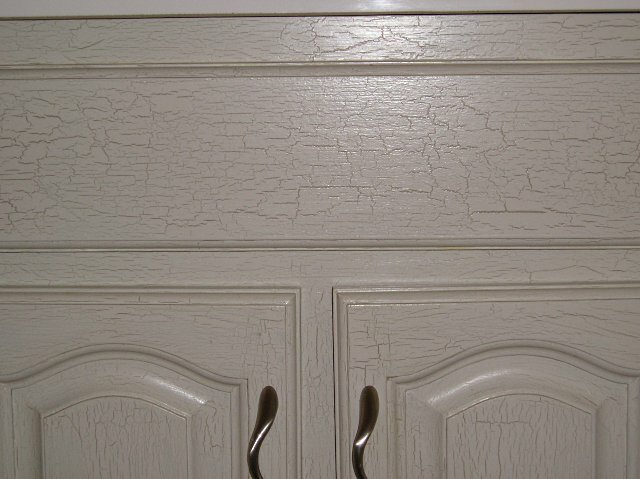 Crackle paint applied to bathroom vanity. There are many types of decorative paints available today. Although these specialized products tend to be more expensive than most standard paints, they can greatly simplify your decorative painting efforts. They also tend to produce very consistent results. Crackle painting is a fun way to make surfaces look old and distressed. Most formulas require a colored base coat, a layer of crackle medium, and then a topcoat; however, some newer formulas require just the base coat and topcoat. As the paint dries, the upper coat cracks and spreads, revealing the contrasting base color. Thicker layers of crackle medium and topcoat create larger, deeper cracks; thin layers create a finer effect. Most metallic paints contain actual metal flakes; if you look closely, you can see individual flecks of metal. Some varieties are magnetic. These formulas are unsurpassed for dramatic effect. They are typically very glossy and hard wearing. Because they reflect so much light, metallics highlight flaws and damaged areas. Apply them only to well-prepared surfaces, and use a soft roller or sprayer to prevent brush marks. Faux stone paints are rough to the touch. Depending on the formulation, these can mimic granite, marble, or other stone finishes. They require no special application techniques; just roll or spray them on. Color selection is somewhat limited, but these paints can be combined with other faux finish techniques to create very realistic effects. Suede paint is available from several reputable manufacturers and looks surprisingly realistic. To use this product, you’ll first need to prepare the surface and apply a base color. You may need two coats for complete coverage. After it dries, apply the suede paint in overlapping, six-inch “x”es. The variations in color look almost exactly like the real thing! You can create your own textured paint inexpensively by adding clean sand, a little at a time, directly to your paint. Years ago, this was a common way to texture ceilings. Remember to stir the paint frequently to prevent settling.